Update: The duration of stay on the e-visa has increased from 30 days to 60 days with a double entry with effect from April 1st, 2017. The window for applying under the e-visa scheme has been increased from 30 days to 120 days. Therefore, it became easier to obtain a tourist visa for India. You can now also apply for a medical or business visa online. However, this requires different documents to be uploaded, see here. 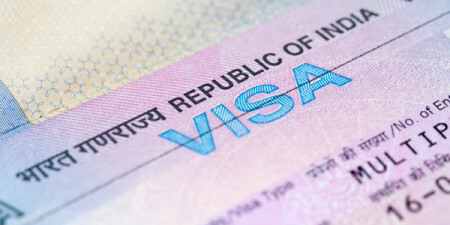 Every foreign citizen is required to obtain a visa before entering into India. For tourists and visitors there are two ways to apply for one: the e-visa and the regular tourist visa. The e-visa is for a shorter period of stay and much easier to apply for. The regular tourist visa is a pain and more expensive, but allows for a longer stay. Depending on your nationality, you can apply from a minimum of six months up to 10 years. So it all depends on your travel plans. We’d like to introduce both options in this article for you. Questions like: who can apply, how much it costs and what the requirements are, are answered here. What is an E-Visa or Electronic Travel Authorization (ETA)? Is it a visa on arrival? The e-visa format resembles a visa on arrival, but is not exactly the same. The applicant needs to submit their India visa forms and pay the necessary fees online. The applicant would be informed online if the electronic tourist visa is granted or not. You don’t have to courier your passport or visit an India Embassy or consulate. Once the visa is granted, which you’ll be notified via email, you could board your plane. The tourist visa will be stamped on your passport on arrival. While similar, it’s still not exactly a visa on arrival, as you still have to apply before you arrive in India. However, it’s a lot less cumbersome than sending passports or having to line up outside an Indian Embassy/consulate. PURPOSE: The Indian Government only considers four reasons sufficient for obtaining this visa. These are: recreational and sightseeing, visiting friends or family, medical treatment for a short duration, and conducting short and casual business. On behalf of the Indian government, our apologies for not including a self-discovery category. PASSPORT: The original document should be valid for another six months from arrival. It should have at least two blank pages to fill up with Indian stamps. Those holding Pakistani Passports or are of Pakistani origin are unfortunately not allowed this convenience. They must apply directly at India Mission for regular passports. Diplomatic/Official Passport holders, those endorsed on Parent’s/Spouse’s Passport and International Travel Document Holders will all have to also make do with the regular method of obtaining visas. PASSPORT: You’ll need to submit a scanned copy of your passport’s information page after filling the application form. PHOTO:If you have a digital copy of a passport sized photo, upload it to the website. Alternatively, scan a regular passport photo instead and upload it, here’s a detailed list of documents and the photo specifications. PROOF OF DEPARTURE: Confirmed round trip ticket so they know you’re not trying to sneak in and start a new life. FEES:The e-visa fee depends on the country of origin. At the moment citizens from 161 countries can apply for an e-visa. To find out the fee applicable for your country please click here. For applications to be eligible they must be submitted no later than 4 days and no earlier than 34 days before the date of arrival. So if you’re the kind that likes their itinerary done and dusted well in advance, you might want to consider a traditional tourist visa for India. You can get a maximum of 2 Electronic Travel Authorizations (ETA) in a year with one of them providing a maximum stay of 30 days. You can pick up a visa on arrival at the airports of Ahmedabad, Amritsar, Bagdogra, Bengaluru, Calicut, Chennai, Chandigarh, Cochin, Coimbatore, Delhi, Gaya, Goa, Guwahati, Hyderabad, Jaipur, Kolkata, Lucknow, Mangalore, Mumbai, Nagpur, Pune, Tiruchirapalli, Trivandrum & Varanasi as well as the cruise seaports of Cochi, Goa and Mangalore. Carry a copy of your ETA at the time of your travel. After you arrive at an airport, you’ll proceed to the e-visa counter where the e-visa will be stamped onto your passport. Afterwards you need go to the immigration counter where they’ll stamp your passport. This might take quite some time at busy airports like Delhi or Mumbai, so allow your self some time if doing a layover. Your Electronic Travel Authorization (ETA) will usually be processed and issued within 3 business days after your online application if approved. How can you apply for a regular tourist visa for India? If you’d like to stay for longer than 60 days, go for the tourist visa, requiring you to send an application and passport to the consulate or through the VFS. In the UK, VFS Global handles all visa applications for India. This visa’s duration of stay is up to 12 months with multiple entries and costs 120 GBP. However, the period of stay without exit is always limited to six months. You can apply in person or by post. It takes a minimum of two weeks until you receive the tourist visa for India and it’s valid from the issued date. In the US Cox & Kings Global Services handles regular visa services. The period of stay is limited to six months but you could apply for a validity of up to 10 years with multiple entries. The cost is 120 USD. Apply in person or by post, but it’s definitely a thorough process. Read more on how to apply here. Australian citizens can apply for a visa with multiple entries for a year, maximum stay of six months on VFS Global. It costs 135 AUD. It takes an average of 5 days plus shipping if you send it by post. A reference from both someone from your country of origin and someone in India. For the latter, you can use the address and number of a hotel or travel agency – like us for example! This might sound exhausting but we promise you: India is worth the effort. If you are interested in a trip to India plan your trip with us now!